Archaeologists in Delaware have discovered the gravestone of a Civil War soldier that may provide a vital clue in uncovering a long-lost African-American cemetery. 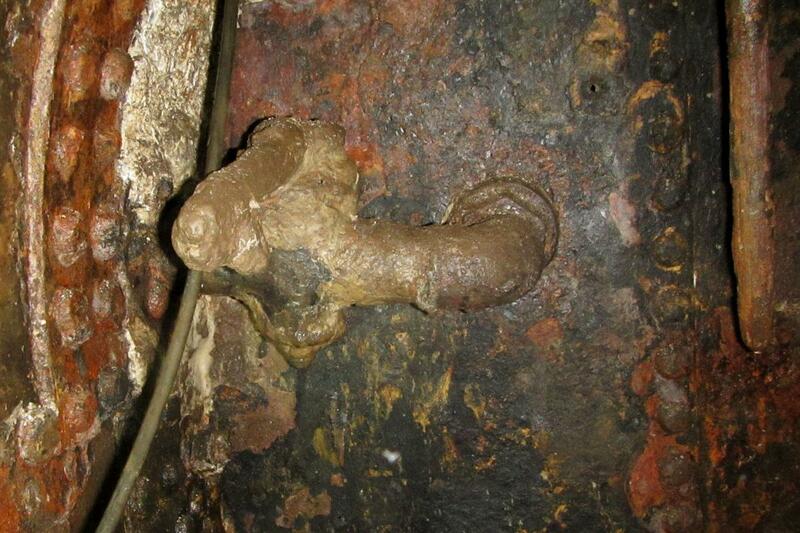 Experts working at a property near Frankford, Sussex County, found the headstone bearing the name “C.S. Hall” and the details “Co. K, 32nd U.S.C.T.” This refers to Company K of the 32nd U.S. Colored Troops, which was a designation for African-American soldiers, according to Delaware's Division of Historical and Cultural Affairs. Working under the guidance of the Delaware State Historic Preservation Office, archaeologists hired by the private landowner uncovered at least other nine graves at the site, which is known as the Orr Property, or Hall Plantation. Experts have not yet matched the headstone to a specific grave, and no information is known about the people buried at the site. 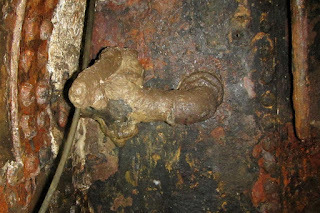 However, the site is known to the local community as containing the remains of African-Americans that lived in the area, officials say. At this stage, the remains of slaves have not yet been confirmed at the site, either through archaeological excavation or analysis of historical records. Nonetheless, the discovery of the Civil War soldier’s headstone offers an insight into the lives of those buried at the Frankford site. The 32nd Regiment of the United States Colored Infantry was organized at Camp William Penn in Philadelphia between Feb. 7 to March 7, 1864, according to the National Parks Service. The regiment was ordered to Hilton Head, S.C., the following month and remained there until June 1864, before moving to Morris Island, S.C., where it participated in operations against Charleston. Later that year, the Regiment took part in the Expedition to Boyd’s Neck and the Battle of Honey Hill. In 1865, the 32nd Regiment also participated in the occupation of Charleston. Much has been written about place and Civil War memory, but how do we personally remember and commemorate this part of our collective past? How do battlefields and other historic places help us understand our own history? What kinds of places are worth remembering and why? 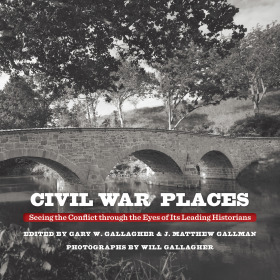 In this collection of essays, some of the most esteemed historians of the Civil War select a single meaningful place related to the war and narrate its significance. Included here are meditations on a wide assortment of places--Devil's Den at Gettysburg, Hollywood Cemetery in Richmond, the statue of William T. Sherman in New York's Central Park, Burnside Bridge at Antietam, the McLean House in Appomattox, and more. Paired with a contemporary photograph commissioned specifically for this book, each essay offers an unusual and accessible glimpse into how historians think about their subjects. There are 26 essays in the book. In addition to the editors, contributors include Edward L. Ayers, Stephen Berry, William A. Blair, David W. Blight, Peter S. Carmichael, Frances M. Clarke, Catherine Clinton, Stephen Cushman, Stephen D. Engle, Drew Gilpin Faust, Sarah E. Gardner, Judith Giesberg, Lesley J. Gordon, A. Wilson Greene, Caroline E. Janney, Jacqueline Jones, Ari Kelman, James Marten, Carol Reardon, Aaron Sheehan-Dean, Brenda E. Stevenson, Elizabeth R. Varon, and Joan Waugh. The Last Battleground: The Civil War Comes to North Carolina, Philip Gerard, University of North Carolina Press, 376 pp., illustrations, bibliographic notes, bibliography, index, $28.00, March 2019. To understand the long march of events in North Carolina from secession to surrender is to understand the entire Civil War--a personal war waged by Confederates and Unionists, free blacks and the enslaved, farm women and plantation belles, Cherokees and mountaineers, conscripts and volunteers, gentleman officers and poor privates. In the state's complex loyalties, its sprawling and diverse geography, and its dual role as a home front and a battlefield, North Carolina embodies the essence of the whole epic struggle in all its terrible glory. Philip Gerard presents this dramatic convergence of events through the stories of the individuals who endured them--reporting the war as if it were happening in the present rather than with settled hindsight--to capture the dreadful suspense of lives caught up in a conflict whose ending had not yet been written. As Gerard reveals, whatever the grand political causes for war, whatever great battles decided its outcome, and however abstract it might seem to readers a century and a half later, the war was always personal. 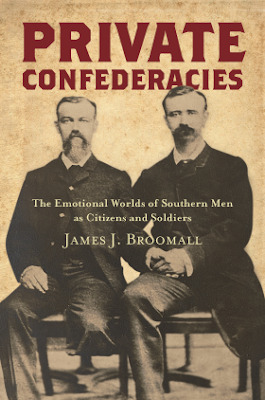 Private Confederacies: The Emotional Worlds of Southern Men as Citizens and Soldiers, James Broomall, 240 pp., University of North Carolina Press, 5 illustrations, bibliographic notes, bibliography, index. Hardcover $90.00; Paperback, $29.95. From The Publisher: How did the Civil War, emancipation, and Reconstruction shape the masculinity of white Confederate veterans? As James J. Broomall shows, the crisis of the war forced a reconfiguration of the emotional worlds of the men who took up arms for the South. Raised in an antebellum culture that demanded restraint and shaped white men to embrace self-reliant masculinity, Confederate soldiers lived and fought within military units where they experienced the traumatic strain of combat and its privations together--all the while being separated from suffering families. Military service provoked changes that escalated with the end of slavery and the Confederacy's military defeat. Returning to civilian life, Southern veterans questioned themselves as never before, sometimes suffering from terrible self-doubt. Drawing on personal letters and diaries, Broomall argues that the crisis of defeat ultimately necessitated new forms of expression between veterans and among men and women. On the one hand, war led men to express levels of emotionality and vulnerability previously assumed the domain of women. On the other hand, these men also embraced a virulent, martial masculinity that they wielded during Reconstruction and beyond to suppress freed peoples and restore white rule through paramilitary organizations and the Ku Klux Klan. James J. Broomall is assistant professor of history at Shepherd University and director of the George Tyler Moore Center for the Study of the Civil War. The Union's politics of deliverance helped it to win the war. But such appeals failed to convince Confederates to accept peace on the victor's terms, ultimately sowing the seeds of postwar discord. 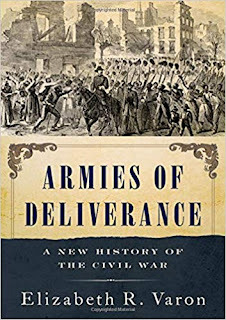 Argues that hard war tactics and soft war appeals were present throughout the war and were harmonized by the idea of "deliverance." 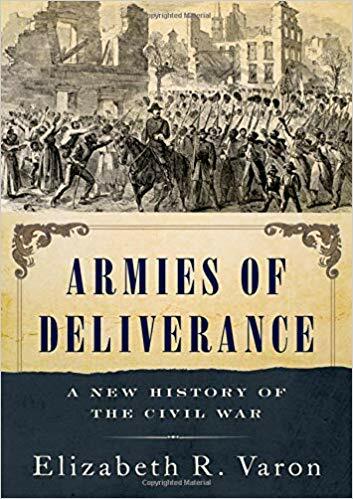 Armies of Deliverance offers innovative insights on the conflict for those steeped in Civil War history and novices alike. Introduction: "We Are Fighting for Them"
About the author: Elizabeth R. Varon is Langbourne M. Williams Professor of American History at the University of Virginia. She is the author of numerous award-winning books, including Southern Lady, Yankee Spy: The True Story of Elizabeth Van Lew, A Union Agent in the Heart of the Confederacy (OUP, 2003), Disunion! : The Coming of the American Civil War, 1789-1859, and Appomattox: Victory, Defeat and Freedom at the End of the Civil War (OUP, 2013). Peter S. Carmichael’s The War for the Common Soldier is, above all else, a pragmatic book. In highlighting the defining characteristics of the men who fought and suffered through the Civil War, Carmichael seeks to bridge a widening rift between more popular celebratory and heroic accounts of soldiers that began shortly after the end of the war—and, advanced most notably by Bell Wiley, continue, in some form to the present day—and an increasingly critical view of the rank and file as unfortunate pawns who, misled by the nationalism that sparked a misguided rush to the colors, found themselves trapped in an unforgiving machine that resulted in misery and death for far too many, a view that seems to have some appeal to those interested in the “darker” aspects of the sectional conflict. Thus, the author joins with Union soldier Amos Judson in pushing back against a “sentimental culture with its enshrinement of extreme courage and its sanitation of the war’s most grotesque elements” (p. 230), while still revealing the laudable conduct and mental agility of soldiers in both armies. As the double entendre in his title suggests, Carmichael seeks to both explore the experience for the common soldier as well as weigh in on the historiographical debate over how he should be remembered. In doing so, the author provides a very useful theoretical construct for understanding how Civil War soldiers conceptualized, endured, and remembered their wartime experiences. In arguing for a defining sense of pragmatism among the soldiers of both armies, Carmichael suggests that they were neither the ideologues suggested by works such as James McPherson’s For Cause and Comrades and Gary Gallagher's The Union War, nor the helpless victims of a wasteful and destructive conflict. Instead, they adapted to their conditions, rationalized both the incredible losses around them and their own, at times remorseful survival, and pragmatically faced the numerous challenges, be they mental, physical, or emotional. Though their idealism often eroded, the author argues that a pragmatic philosophy “never left Northern or Southern soldiers standing on the barren ground of nihilism” (p. 99). Well grounded in the relevant secondary literature, but relying extensively on soldiers’ letters, Carmichael counters the usual technique of using short snippets to support an argument by developing longer case studies, or “microhistories” of certain soldiers to place their evolving thoughts in context, resulting, in a nod to Clifford Geertz, in a “thick description approach” (p. 175). Most of the seven chapters (though several deviate from this format) rely on from three to six of these case studies to provide soldiers’ conceptions of the war, from resisting the temptation to desert to staying connected with the home front to rationalizing the hand of providence’s role in victory or defeat. While the examples (apparently despite the best efforts of Earl Hess) skew heavily toward the Army of the Potomac and the Army of Northern Virginia, the larger numbers serving in the eastern theater probably justify the greater emphasis. In an acknowledgement of the growing importance of the subfield of guerrilla studies, Carmichael feels compelled to include a full paragraph on why he chose to exclude this group, despite “some of the most exciting and engaging scholarship coming out of the field of Civil War history,” as “its inclusion would have diverted attention away from my primary focus on conventional armies” (p. 13). 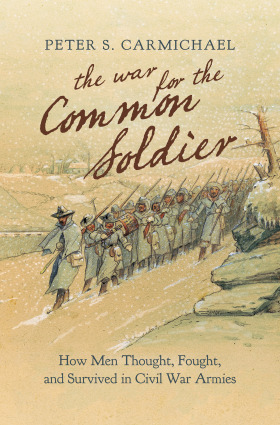 The result is a fairly comprehensive cultural and intellectual history of the common soldier that largely overcomes concerns about representativeness, though Carmichael accepts that “no single individual can possibly represent the 2.7 million men who served in the Union forces and the 1.2 to 1.4 million men who stood in the ranks of the Confederate military. There was no common soldier in the Civil War” (p. 12). But the wealth of resources available on those soldiers who ran afoul of the military’s justice system results in a slight over representation of that demographic. This review is continued at H-Net. CWL: Indeed, Carmichaels' work is splendid and opens to readers the lives and letters of Civil War soldiers, in the midst of the war. This time next year tourism-driven businesses may be pinching pennies to afford access to the national park. The National Park Service (NPS) plans to hike fees businesses pay to operate on park land and has hinted it will deny permits for organized recreational activity at Gettysburg National Military Park (GNMP). GNMP issued a notice last July stating Commercial Use Authorization (CUA) fees will increase over the next three years, starting Oct. 1, 2019. A CUA “allows an individual, group, company, or other for-profit entity to conduct commercial activities” on park land, according to nps.gov. This includes businesses that offer tours on horseback, Segway, and bicycle, GNMP correspondence indicates. The change will not affect visitors who tour the park in private vehicles. Businesses that make less than $250,000 annually from “park-based operations” will have to pay 1 percent of their gross income for a CUA every year, then 2 percent starting Oct. 1, 2020, followed by 3 percent as of Oct. 1, 2021, according to a letter signed by GNMP former Acting Superintendent Christopher Stein. Businesses that make between $250,000 and $500,000 will pay 1.3 percent the first year, 2.6 percent the second year, and 4 percent the third year, according to the letter. Businesses earning more than $500,000 will pay 1.6 percent, 3.3 percent, then 5 percent, respectively. This is in addition to the $300 non-refundable application fee for the CUA. While 1 to 5 percent may not sound like a lot, it can be a heavy burden for smaller businesses. “Everybody is just astounded and worried about their business,” said Bob Velke, of Segway Tours and Rides of Gettysburg. The majority of their tours are on park property, Velke said. He estimates he will have to pony up more than $30,000 per year when the new fees take effect. In order to compensate for the financial burden, Velke expects he will have to hire fewer staff members, who are all locals, and/or increase tour prices.“The customers are not going to like it,” Velke said. Having operated in Gettysburg for 12 years, Velke said Segway Tours has an immense respect for the hallowed ground that has become their office. Tour guides often pick up trash they find along the way and report maintenance issues to park staff, according to Velke. “As responsible vendors who love the park, we realize that a modest increase in usage fees may be necessary in order to maintain the park and enforce its rules,” Velke said. But Velke wishes the National Park Service would go about it another way. While Velke said he is prepared to pay his “fair share,” he believes the fees are too high and being rolled out too quickly. “There hadn’t been any discussion. There hadn’t been any warning,” Velke said. Commercial bus tour operators face a financial struggle, too. The NPS stated in CUA-related correspondence that bus companies will have to pay $5 per passenger to the park, which is an entirely new policy. Vice President of Destination Gettysburg Stacey Fox predicts this change to CUA fees will have the biggest impact on tourism. More than 1,500 motor coaches come to GNMP every year, according to Fox. Many of those passengers are students embarking on field trips. Last November, 420 veterans and their guests toured the battlefield by bus during a trip organized by All Vets to Gettysburg. Fox expects bus companies will offer fewer tours and/or raise prices to compensate. GNMP is not entirely to blame for these changes, Fox said. The decision to increase CUA fees comes from the federal level, the Department of the Interior, but individual national parks decide how they want to implement the fees (over time versus all at once) and whether they want to increase fees to maximum or not. Fox said GNMP and the Eisenhower site are hiking fees to the max. After years of hosting 5Ks and, more recently, a marathon and half-marathon, Gettysburg park officials told the YWCA of Gettysburg and Adams County they will deny any future applications for a recreation permit. The YWCA has organized the Spirit of Gettysburg 5K since 1991, which takes place on GNMP property, according to Executive Director Deb Geesey. In 2015, the Gettysburg Foundation approached the YW about starting a marathon to benefit the park and the YWCA, Geesey said. The Gettysburg Battlefield Marathon was born the following year. The letter goes on to explain the reasons the park superintendent can deny permits for such activity. While the letter does not say race permits will be denied, it reads “…we are considering changes to areas where we will permit running and bicycling events” and suggests routes that are not on park property. The permit for the 2018 marathon was denied but the YWCA successfully appealed. Geesey said she met with NPS Interim Superintendent Danny Smith in June. Smith instructed local park officials to approve the 2018 plans for a full and half marathon with the understanding that the park service may be more open to only a half in 2019. The YWCA was open to the change, Geesey said. Then during an October 2018 marathon planning meeting, representatives from the YWCA and park service were present, according to Geesey. During a discussion regarding the 2019 race, a park employee said the YWCA’s permit for the half marathon and 28-year-old Spirit of Gettysburg will be denied next year. “Everybody was dumbfounded,” Geesey said. Runners came as far as Georgia, North Carolina, New York, Ohio, Virginia, and Tennessee to attend the marathon and Spirit 5K, according to a YWCA survey. Many of the participants cited local restaurants and hotels they visited during their stay.Some of the runners Geesey met told her they wouldn’t have come to Gettysburg and visited the battlefield had it not been for the race. 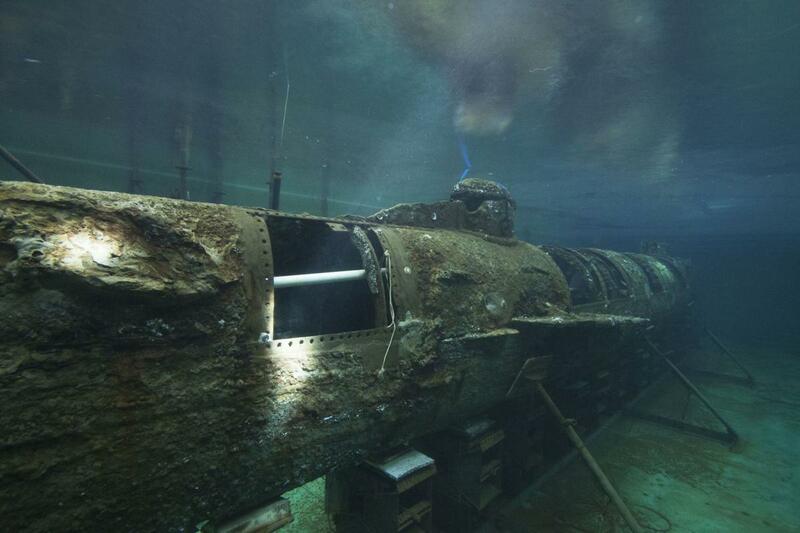 “We’ve made the effort to make it as historically educational as we could,” Geesey said. The Spirit 5K, half-marathon, and full marathon accounted for 15 percent of the YWCA’s fundraising and events budget for fiscal year 2017-2018, according to Geesey. The YWCA shares the proceeds of the half and full marathons with the Gettysburg Foundation, which serves to benefit the national park, Geesey said. Geesey, Fox, and Velke each expressed concern over the ever-changing leadership at GNMP. “At the end of the day, we don’t know who the decision makers are,” Fox said. The park is currently on its fourth acting superintendent since May 2017. All was never quiet on the Western Front for long. The title of Erich Maria Remarque’s great novel about the Great War is bitterly ironic: Silence lulls its exhausted soldier hero into fatally reaching out from his trench for a butterfly. The silence of film footage from that war (1914-1918) has lulled us into thinking of it — if we bother to think of it at all — as something soundless and monochromatic as the Civil War of the 1860s. 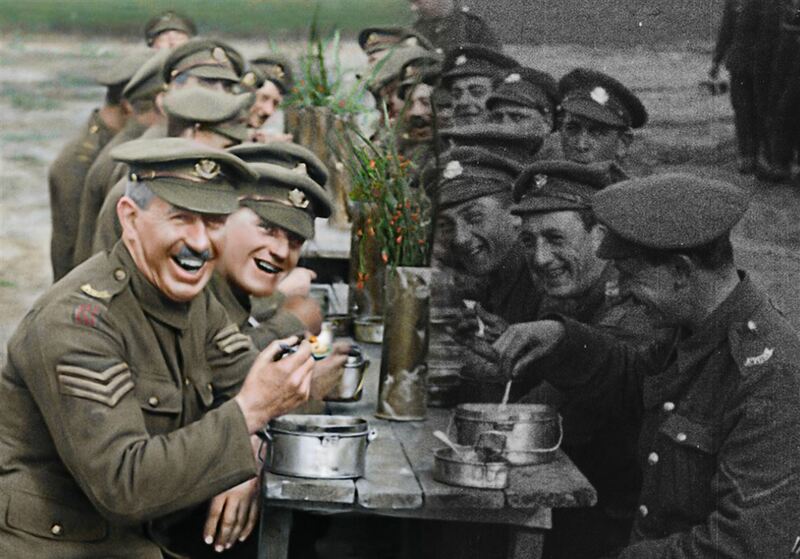 That should change with “They Shall Not Grow Old,” Peter Jackson’s extraordinary World War I documentary, commemorating the conflict’s centennial with a brilliant enhancement of hitherto unseen film material from Britain’s Imperial War Museum. A joyful noise opens this far-from-silent movie, just as it opened the conflict itself: Patriotic crowds and parades throughout England cheer their support for thousands of young recruits hungry for heroic adventure. Many are 16 or 17 — more than a few just 15 — all claiming to be 18 or 19, so as not to miss out on the action. The noise increases with marching, singing and drilling — shades of Richard Attenborough’s “Oh! What a Lovely War!” (1969) — until superseded by the more deafening sound and fury of battle, as the eager new soldiers on their way to the front pass the shell-shocked ones staggering away from it. Only then do the images come to astonishing life in color. 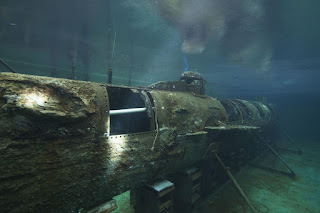 We begin to see grim details of the complex trench systems — dead bodies hanging on barbed wire, live bodies, lousy with lice, fat rats and frozen feet and blinded mustard gas victims holding onto one another’s shoulders in a row. And for the first time, we see the real faces of real men — including German POWs, as young and frightened as their captors — in stunning close-ups as sharp and fresh as those on your new iPhone. More fascinating, perhaps, is the footage of daily life (if you escaped death): However traumatized or wounded from the night before, soldiers had to be freshly washed and shaved the next day — a routine they came to rely upon. They also discovered that the near-boiling water that cooled down the machine guns could be used to produce a half-decent cup of tea. New Zealand director Jackson — much acclaimed for the dazzling special effects of his “Lord of the Rings” trilogy (2001-2003) and “King Kong” (2005) — makes excellent use of that expertise for a higher cause here. His fine documentary contains an “optional epilogue” on the making of it, in which he explains the restoration, colorization and enhancement processes. Most crucial was the problem of shooting vs. projecting speed. In the World War I era, 16 frames per second was the norm, but since cameras were hand-cranked, there was really no reliable “standard.” Cranking was anywhere from 14 to 18 fps. Mr. Jackson shows us how a single frame more or less (per second) makes a huge difference in verisimilitude to life when projected. Synchronizing variably-cranked footage to real-life projection — frame-rate adjustment — required sophisticated computer algorithms to generate “missing” frames and thus smooth out the jerkiness. The director’s painstaking demand for authentic detail is legendary. My colleague Charles Constantino reminded me that, for his “Lord of the Rings” films, Mr. Jackson insisted the Hobbits wear underwear precisely fashioned according to Tolkien’s description — despite the fact those undies never appeared on screen. Here, he makes similarly meticulous audio and visual demands, from the exact color of the grass in Flanders to the correct sound of boots sinking into and sucking out of deep mud. With a lifelong obsessive-compulsive interest in WWI, his vast personal collection of uniforms and weapons came in handy — as did his hiring of forensic lip-readers to glean what precious dialogue they could from the footage. There’s no narration — only the voices of real soldiers who experienced the conflict. The only big disappointment is the film’s dubious 3D — a technical bridge too far. Otherwise, it’s a haunting historical achievement and work of love, unapologetically Anglocentric in its exclusive focus on the Western Front, where no fewer than a million citizens of the British Empire were killed. The failure to include even rudimentary information of the war’s causes and larger scope bothered me. Not even one contextual reference to the equally bloody Eastern Front? Not a map or two of the geographically confusing campaigns to help us make sense of the action? But I think I understand why. With 10 more minutes or 10 more hours, you can’t make sense of the senselessness of such staggering magnitude. You can only see and mourn these particular young men, meeting our gaze after a century, dying nobly in service and sacrifice to old men’s stupidity. Historians have long treated the patriotic anthems of the American Civil War as colorful, if largely insignificant, side notes. Beneath the surface of these songs, however, is a complex story. “Maryland, My Maryland” was one of the most popular Confederate songs during the American Civil War, yet its story is full of ironies that draw attention to the often painful and contradictory actions and beliefs that were both cause and effect of the war. Most telling of all, it was adopted as one of a handful of Southern anthems even though it celebrated a state that never joined the Confederacy. In Maryland, My Maryland: Music and Patriotism during the American Civil War James A. Davis illuminates the incongruities underlying this Civil War anthem and what they reveal about patriotism during the war. 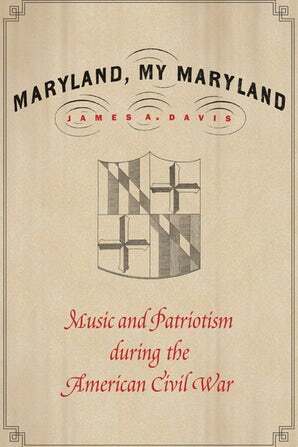 The geographic specificity of the song’s lyrics allowed the contest between regional and national loyalties to be fought on bandstands as well as battlefields and enabled “Maryland, My Maryland” to contribute to the shift in patriotic allegiance from a specific, localized, and material place to an ambiguous, inclusive, and imagined space. Musical patriotism, it turns out, was easy to perform but hard to define for Civil War–era Americans. About the author: James A. Davis is a professor of musicology at the School of Music, State University of New York at Fredonia. He is the author of Music along the Rapidan: Civil War Soldiers, Music, and Community during Winter Quarters, Virginia, 1863–1864 (Nebraska, 2014) and editor of several books, including The Arts and Culture of the American Civil War. 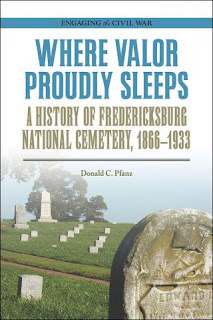 Where Valor Proudly Sleeps: A History of Fredericksburg National Cemetery, 1866-1933, Donald C. Pfanz, Southern Illinois University Press, 253 pages, 40 illustrations, appendices, bibliographic notes, bibliography, index, $26.50. Little do they realize that at the top of the hill behind them is the Fredericksburg National Cemetery which is the final resting place for over 15,000 United States soldiers. Most of the soldiers died during the Civil War, but there are about 100 20th century soldiers and a few of their spouses. The Union Civil War soldiers buried here include those who died of illness in the camps around Fredericksburg, in the four major battles around Fredericksburg as well the Mine Run and North Anna campaigns. Only about 20% of the soldiers are identified. Confederates who died in the Fredericksburg area were interred in other cemeteries in Fredericksburg and Spotsylvania. In July 1865, Congress authorized the establishment of a National Cemetery in Fredericksburg to honor the Federal soldiers who died on the battlefields or from disease in camp. The site chosen was Marye's Heights, the formidable Confederate position which had proven so impregnable to repeated Federal attacks on December 13, 1862. Pfanz's splendid work describes wartime and postwar burials, the demand to create this cemetery and the the final implementation of the plan. The author pays attention to the care given by the superintendents, the cemetery employees, Memorial Day commemorations and the supervision of the National Park Service. Where Valor Proudly Sleeps will serve as a model of future public history narratives. The writing style is accessible to advanced placement history students and the general public. 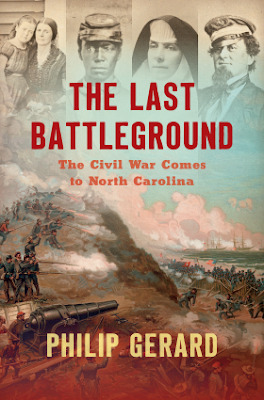 From the publisher: Many books discuss in great detail what happened during Civil War battles. This is one of the few that investigate what happened to the remains of those who made the ultimate sacrifice. 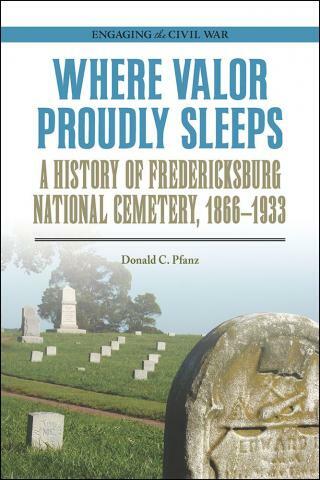 Where Valor Proudly Sleeps explores a battle’s immediate and long-term aftermath by focusing on Fredericksburg National Cemetery, one of the largest cemeteries created by the U.S. government after the Civil War. Pfanz shows how legislation created the National Cemetery System and describes how the Burial Corps identified, collected, and interred soldier remains as well as how veterans, their wives, and their children also came to rest in national cemeteries. By sharing the stories of the Fredericksburg National Cemetery, its workers, and those buried there, Pfanz explains how the cemetery evolved into its current form, a place of beauty and reflection. About the Author: Donald C. Pfanz has written five books, including Richard S. Ewell: A Soldier’s Life and War So Terrible: A Popular History of the Battle of Fredericksburg. In his thirty-two-year career with the National Park Service, he worked at Fredericksburg and Spotsylvania County Battlefields Memorial National Military Park, Petersburg National Battlefield Park, and Fort Sumter National Monument.